With swift, bold and powerful writing, debut author Alison Littman tells the story of a family ripped apart by revolution, illuminating a time when news, rock 'n' roll and underground journalism forever changed the lives of those living behind the Iron Curtain. After years of suffering under the communist regime in Cold War Hungary, Eszter Turján—fanatical underground journalist—would sacrifice anything, and anyone, to see the government fall. 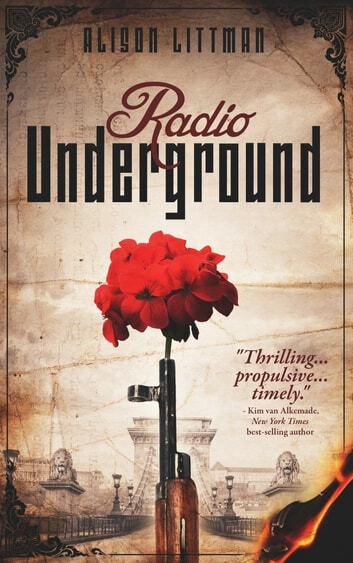 When she manipulates news broadcasts on Radio Free Europe, she ignites a vicious revolution, commits a calamitous murder and is dragged away screaming to a secret underground prison. Her daughter Dora, then a teenager, cowers in her bedroom as the secret police arrest her mother. Haunted and hurt, Dora vows to work against everything Eszter believes in. But, it's not that simple. After nine years, Dora meets a strapping young fan of Radio Free Europe and is unwittingly drawn back into Eszter's circle. She finds her mother, driven mad by years of torture, is headed for death. On the brink of losing Eszter again, Dora must decide if she should risk her life to save the mother who discarded her—or leave it to fate.Radio Underground is a beautiful, relevant novel that explores the lengths and limits of love, family and the power of expression. This story brought the suppression of the Cold War to life for me, despite the fact that I was a (Western) teenager myself at the time. The author’s clever use of “English by Thesaurus” in creating Mike’s letters was a highlight for me. Keep writing, Alison! Each character gives a true perspective of Hungarian repression at this historical time in history. A real page turner.